(Of course it wasn't vegan, so I chose to watch and take notes and drool as my kids messily and greedily inhaled ear after ear...) And then we went home and I whipped up my own, VEGAN batch of "Mexican Street Corn". And it was AMAZING. And I thought I'd discovered something exciting and new. Well, I guess Mexican Street Corn is just common, ordinary street food. And has been around for a very long time, and Bobby Flay's been doing his version all over Food Network for years; And I'm not very original in "vegan-izing" the recipe, because after a little internet searching I discovered that the fabulous Terry Hope Romero has her own marvelous-sounding vegan recipe in her cookbook, Viva Vegan. Should you want to try her recipe, you can buy the book, or find it here: Street Corn. However, I didn't know all of this when I dashed home delightedly to invent my OWN vegan version, and it IS different, so I am going to post it here for you to enjoy, should you wish to try it... This is perfect for a BBQ or when you've built a fire in the back-yard fire pit. And if you think that sour cream and cheese and lime sound odd on fresh-roasted corn... well, PLEASE give this a try anyway. You will be HOOKED, I promise!! Chili-Lime seasoning (We use "Tajin Chili & Lime"). 1. Husk corn, wrap in several layers foil (*or grill in the husk if you prefer - I don't like the mess, but it's your choice). Grill over BBQ or backyard fire pit until tender and starting to char in spots. (I have no scientific method here, just cook 'till done). 2. In a small bowl, combine vegan mayo, vegan sour cream, salt and lime juice. Whisk together to make it creamy. 3. Mix 'cheese' and nutritional yeast in another small bowl. 3. Remove corn from foil (or husk), put on plate. 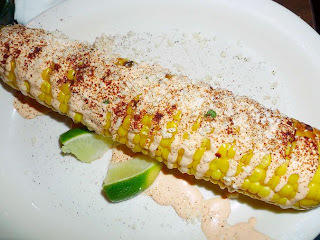 Rub corn with lime wedge. Spread, or drizzle sour-cream sauce all over corn. 4. Sprinkle cheese-mixture on corn. Sprinkle fresh cilantro and chili-lime seasoning liberally on corn. This sounds delicious!! I particularly like the combination of vegan sour cream and mayo along with the heat and acidity of the chili-lime seasoning and fresh cilantro. And thank you for a shout-out to my blog...much appreciated! Man I love this stuff! This summer while in Charleston SC I went to Taco Boy where I saw my first order of Mexican Street corn, also not vegan! It looked so good I had to come home and veganize it! The internet is a wonderful thing...all I do for mine is clean then grill the corn. Then I mix veganaise with some chipotle chili powder and cayene pepper. Rubbed that all over the corn, rolled it in some Daiya pepperjack cheese then squeezed some limes on it. NOM NOM I will have to give yours a try too it sounds delish! I do believe I have probably eaten several tons of this in my lifetime and I still need more. Its still one of my mostest favoritest things..yes those are words. Trust me. I now know what I am having for dinner tonight. YUM! This looks great. Reminds me of the fire roasted Indian Style corn I've had!